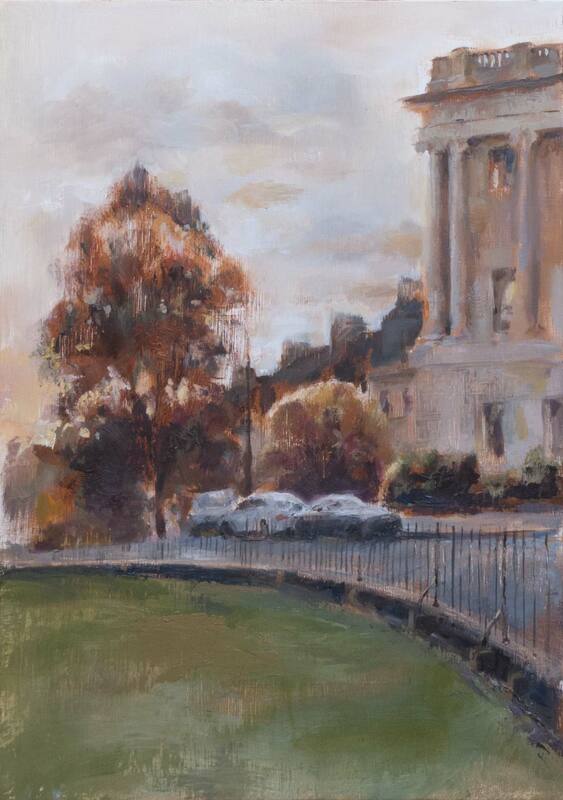 The end of the Royal Crescent in Bath, painted in oils on the new aluminium composite panels. 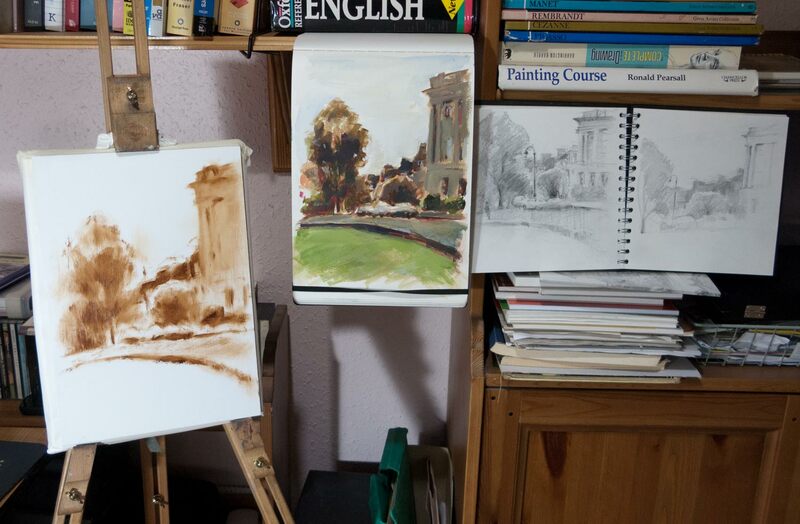 This began as a pencil sketch made on location but was painted at home on the easel. I revisited the scene a couple more times at the same time of day to make further pencil sketches of details and light effects. The late autumn mid-afternoon light created some interesting edge lighting on the trees and columns. Various sketch references and an acrylic colour study. The vine charcoal sketch below was useful for overall composition. 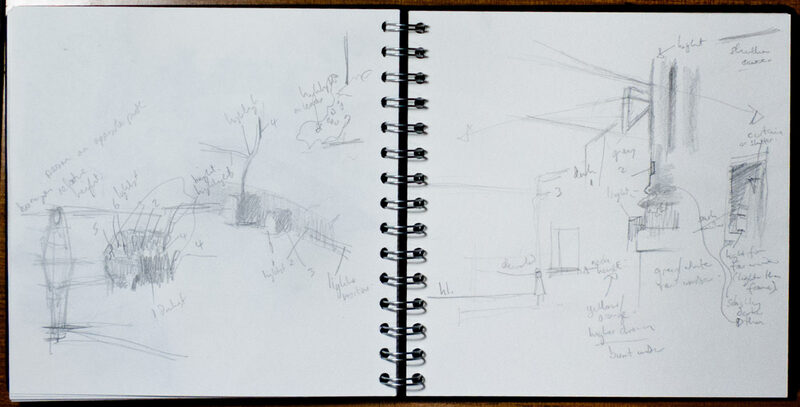 The original pencil drawings and other notes are in the spiral-bound sketchbook. The aluminium composite panel was attached to the easel with tape and Blu Tack. I took a reference photo which was useful for correcting proportions and details, but many of the important light effects in the scene were lost. The strange thing was that they were there in the photo, but somehow they had been flattened out and weren’t noticeable. In the continuing debate about painting from life against painting from photo reference, I found this approach of doing both worked quite well. The most important thing I found was that drawing anything for any length of time has the effect of imprinting the scene on memory — not so much the overall composition, I still needed the sketch and photo for that, but the sense of depth, the subtle lighting effects and the overall atmosphere of the scene. For instance, there was a shift in the warmth of the stone between the crescent in the foreground and the buildings behind. And the road in the middle-ground has a steep camber which somehow added to the depth of the scene. 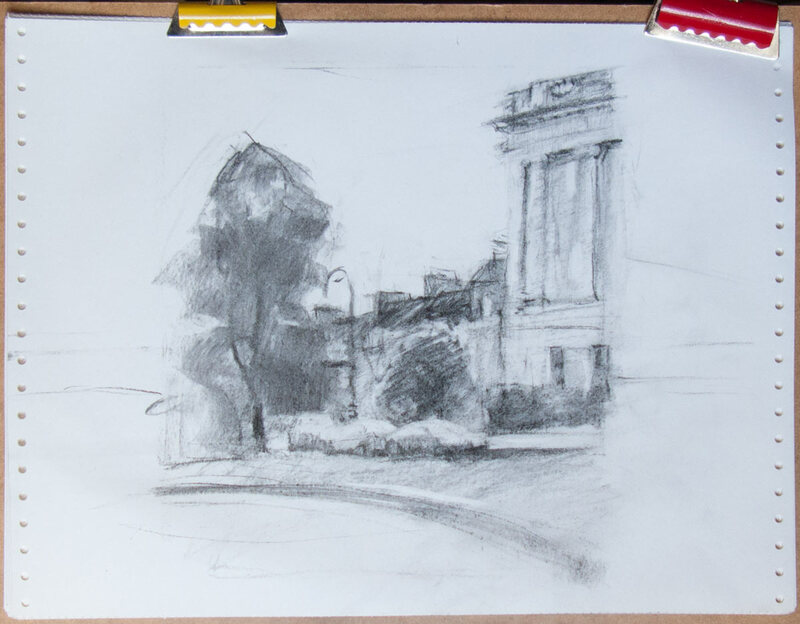 As I was making the first pencil sketch, leaning on the cast iron railings in front of the crescent, the late afternoon sun came out from behind the clouds and flooded the scene with golden light. The edges of the trees and buildings lit up, and everything else was plunged in to deep, warm shadow. It was a completely different scene and it only lasted a few seconds. It would have made for a more dramatic picture, and it certainly made me aware of how ‘light’ and ‘dark’ in our visual perception are relative to their surroundings. All these memories played in my mind as I was painting, and it certainly made the process of painting much more interesting. Whether I can capture these perceptions using oil paint is another matter, but I certainly won’t be able to paint what I didn’t see in the first place.